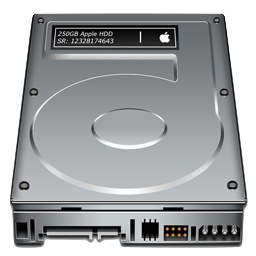 If you want to create a new partition, modify a partition table, or remove an existing partition from any hard disk drive in Mac OS X, you won’t need to use anything fancy other than the bundled Disk Utility app that comes with all versions of OS X. Disk Utility has all the tools on hand necessary for modifying partition tables of any Mac drive, and it’s easy to use after a little guidance. Before going any further, be sure to have a full backup of your hard drive and all important data and documents before adjusting partitions in any way. This is to insure file recovery is simple just in case something goes wrong with the partitioning process, the simplest way to do this is to start a quick manual backup through Time Machine and letting it complete. Once you have an adequate backup made of the Mac, proceed with this walkthrough to learn how to add a new partition, modify and resize existing partitions, and how to remove them too. You can make partitions any size as long as you have the available disk space to accommodate it, and creating the partition shouldn’t affect your existing filesystem either as long as there is free space. Nonetheless, there is always a chance something could go wrong, which is why I recommended you backup your drive first. After you have clicked ‘Apply’ to create the new partition, it will be immediately accessible in the Finder to use how you want. A new partition will behave like a new hard drive, and it will appear on your Desktop as a new drive which can be ejected, mounted, formatted, just like a hard disk. 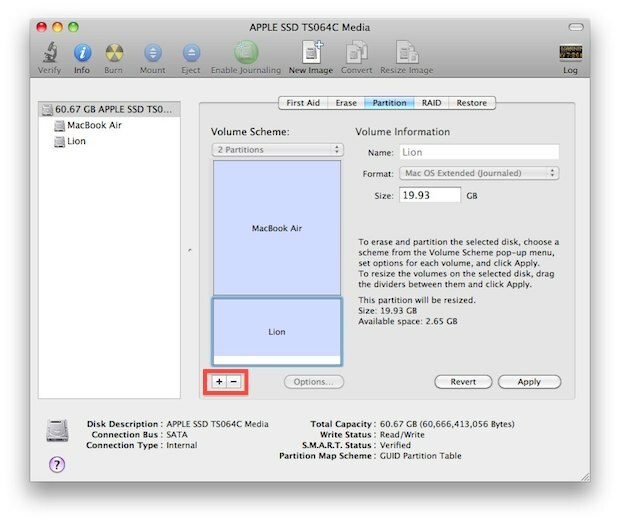 The video below demonstrates how to partition a hard disk in Mac OS X with the new versions of Disk Utility, found in El Capitan 10.11 and later releases of Mac OS system software. I partitioned my drive before installing Mac OS X Lion so that I could maintain my stable Mac OS X 10.6 system software while still exploring the Lion 10.7 Developer Preview, and I do this frequently with other software releases as well, even with El Capitan and Snow Leopard side by side on different partitions. Another common use is to partition large external hard drives for a specific Time Machine backup partition, and then a separate storage partition. Time Machine will backup a drive until the available space is taken, so if you set it to backup to a partition, it will only take up that space and leave the other partition alone, allowing the drive to serve multiple uses and allowing you to effectively share a single hard drive for both Time Machine and other uses. Removing partitions is just as easy as creating one. All you need to do is follow the steps above to get to the partition table, select the partition you want to delete, and then click the “-” button rather than the plus icon. Remember, if you delete a partition, you will lose data that exists on it. Click “Apply” for changes to take effect on the drive. You do not need to reboot for any changes to take effect. As always, have a backup ready before making any changes to partitions, it’s rare that something will go wrong but in the event it does, you’ll be happy to have a backup handy so you can restore as quickly as possible. You need to defrag your HD before adding a new partition, especially when the HD has been in use for a while. Not totally correct. If you have a Mac Journaled file system (as is shown in the screen-shots), there is no such thing as defrag. Not sure you’re right about that. I had this situation a month ago. My HD (with no partitions) was/is Mac Journaled. The only way I could partition it was by first defragging. Until I tried that, I constantly got failures. Most defrag processes remove VM and sleepimage files, so they create more space, thus allowing that couple of additional GB needed to create the new partition. If you make the new capacity for the startup disk too tight, the system could get slower later, since it won’t have the extra space needed for VM and sleepimage files. It’s better not to defrag when partitioning fails. Instead, make the new partition smaller. The real problem is having a small capacity drive and wanting to pretend it is larger. Mac OS X doesn’t need to be defraged. Plus if you own an Solid State Drive (SSD) the manufacturers highly recommend you DON’T defrag as this seriously reduces disk life. Gah why didn’t I think to partition my backup drive! It’s a hassle for me to delete them now I can just reformat the partition! Whats the chance of screwing up your hard drive? i want to try Lion but don’t want to risk my data and lose it for the second time (first time mac got stolen). Repartitioning is one of the highest risk things you can attempt with your data. If something goes wrong, like a power failure or human error, the damage to your data will be catastrophic. So don’t do it without backing first. At least buy a cheap external USB harddisk. I was just reinstalling 10.6 and repartitioned my harddrive. It’s important to click ‘Options…’ and select ‘GUID Partition Table’ before you apply the new volume scheme. No it’s not important. The drive was already GUID. That’s how it shipped from Apple. When I setup a Linux system it always requires that there be a partition dedicated to SWAP in the tables. I can’t find anything about this for the Mac, does this mean the Mac doesn’t use a swap partition? Or the utility takes care of all these little details automatically when you proceed with an installation? Mac OS X handles swap itself, without a dedicated swap partition. For some reason the + button to add a new partition is grayed out. What am i doing wrong or missing? You’re running Snow Leopard which treats the boot drive differently, you may need to boot off a DVD or USB key to partition the primary disk in that case. In OS X Lion, you can partition from the boot drive. Notice the “Size” is 499.76GB and the “Available space” is also. Time to try “Repair Disk”. Something is wrong with this picture. Disk Utility calls it the startup disk, yet it has no files. I really appreciate this valuable information and want to share my own experience with you. I am using third party tool for partitioning of hard drive with some advanced features of hide/reveal and automatic adjustment of free space together in your drive is possible only with stellar partition manager. My friend helped me to create a partition on my HDD and now I want to remove it. The partition is only 50 gigs and was meant to be a simple backup partition, only somehow everything I do ends up in the partition and not on my startup disk. I’m copying over all my files to my main HDD now and then deleting everything from the partition; though whenever I try to do ANY action to the partition, I am told that the partition cannot be modified. Check the format. Is is NTFS? Then ask your friend why he did that. Mac OS doesn’t come with the option to erase files on NTFS. You don’t need to erase the volume to remove the partition. Just remove it it. When trying to create a partition on my brand new Mac mini 2012 with fusion drive, it failed and left my harddrive split into two partitions, one being free space. I can’t change the free space to another filing system or delete the free space. I also can’t extend my first partition with mountain lion on it. Now I’m stuck, when I verify disk it says to repair disk. I tried repairing the disk and it said to repair the disk…even though I was trying to. Same response in recovery mode. Does anyone have any ideas? If “Repair Disk” finds errors, repair again. If it is unable to repair, you might jump through a lot of expensive hoops to use a third-party repair utility, or just erase and reinstall. At the prompt, type in the command fsck -fy. When that finishes, type reboot. Try resizing again in Disk Utility. You can “Repair Disk” in Disk Utility without booting to single-user mode. fsck is just a simpler form of disk repair. It isn’t better than Disk Utility. Hi, my MacBook was have two partition but recently I was have deleted one using boot camp assistance one which used for the window . But while repartition with Mac I am getting the message that, “Couldn’t modify the partition map because file system verification failed”. Please help to restore my HD partition. I don’t have a partitions tab in disk utility. I’m using OSX version 10.9.4. I want to use HGST Touro Mobile Mx3 hard drive as both a back up and to store files. If i create a new partition using the partitian tab in the disk utilities and want to install windows 8.1 on that partition, how would I go about doing that? I already have the windows 8.1 disk image. Reboot from a separate bootable disk, you can’t delete a partition with the active OS X install on it. You’ll break your Mac by doing so, the prevention is intentional. I have successfully created a partition on my mac os x. I am unclear how to duplicate everything on the first partition to the second. I would also like to install Yosemite on the new partition. Do I do that first then move/copy files and apps…..lost on that part. Your instructions are very clear. Thanks. I have a 2014 macmini running 10.11. I have an old photoshop program that’s PowerPC and my current computer will not support it. I’m thinking of creating a partition with 10.3 ( which is what I have some old discs of, probably can upgrade online) and running it from there. Anyone know if it will work? And will I be able to share files between the OS’s in a dropbox or something ? Somehow I changed my bootcamp file system from windows to mac OS X journaled when I was stupidly trying to change the bootcamp drive size. I’m hoping that if I change this back I will get my bootcamp files back? You can’t change the file system without formatting, maybe you erased the partition. hi i bought SSD drive from my friend and it was NTFS,I used Disc Utility to erase it and after that Disc has 60Gb(before was 1TB) any solution how to resize it to previous capacity?